How to Create a Bright & Girly Gallery Wall on a Budget. 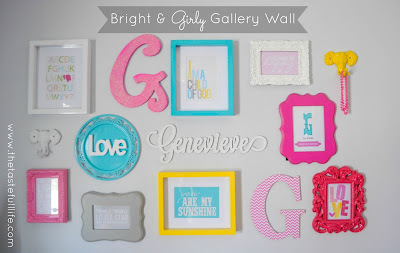 I finally finished Genevieve's gallery wall! I don't think I could be more excited. It's amazing the difference having something on the walls makes in the room. It went from looking "in progress" to looking nearly complete. A little background on the wall: I've been gathering items for it since before Nadia was born--just a frame here and there. 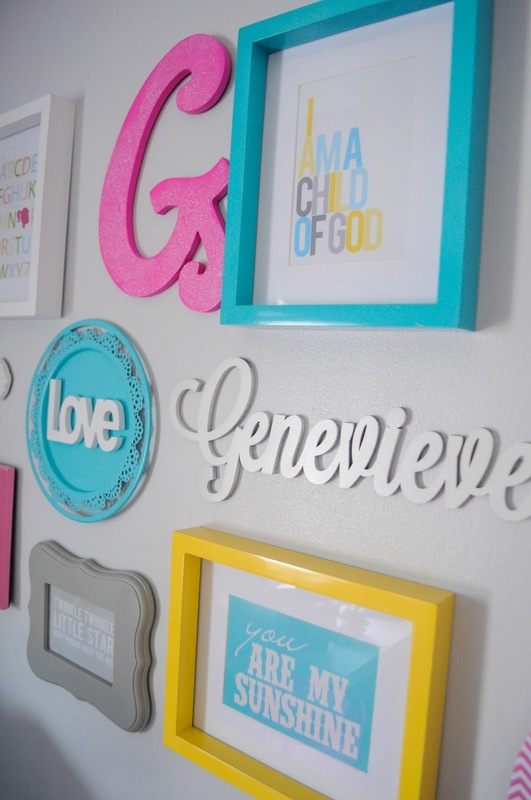 I also used several frames from Genevieve's nursery. As is the case for most of my projects I wanted to keep it low budget. All of the frames were really inexpensive. And even better--all of the prints in the room were FREE. Clearly, I'm pretty excited about that. sorry for the crappy cell phone shot. 1. I gathered all of my frames/objects (collected over time). 2. I Gathered all of my FREE printable art. 2a. Optional: Because I had so much art in various color ways (Yay for graphic designers handing out freebies like candy! ), I decided to print them all so I could narrow it down. Rather than use up all of my ink to do so, I used Wal-Mart's online photo service and printed them as matte 4*6 prints. 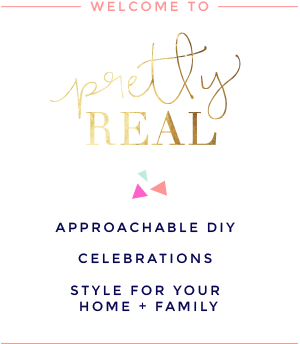 *Note* Some of my free printables were PDFs. I used Zamzar to convert them to JPG files. 4. I measured the space on the wall to figure out how large the "gallery" would be. 5. Then I used this method of lying all of my frames/objects out on wrapping paper (sized to fit the measurements from step 4), arranging and rearranging them to get them in just the right places, and tracing. 5. I used painter's tape to hang the big piece of wrapping paper on the wall. 6. I measured the hangings on the back of the frames so that I could add penciled dots on the "drawing," where I'd place the nails. 7. I then begun hanging one piece at a time. For some frames, I used command strips (since they didn't have hanging hardware on them). [Insert a few errors within those steps!]. Helpful hints: Take a look at the link I included for more "process" photos. Some people use a level. I didn't since my items weren't all the same size or laid out in an orderly way. Okay-- and because I'm super impatient and that would've taken longer. Also, when I needed enlargements of the prints I decided to use, I used Shutterfly. The quality and color is way better than Wal-Mart. It's a bit more expensive but worth it. Although I LOVE it, I'm considering swapping out one of the photos for a family photo. What do you think? I get giddy looking at it. Frames/Objects: from Left to Right. Sort of. White, Blue, and Yellow 8*10 matted frames: Christmas Tree Shop. $3.99 each. Yellow Elephant: Hobby Lobby (more info here.). $3 (50% off $5.99). I spray painted it with paint I already had. 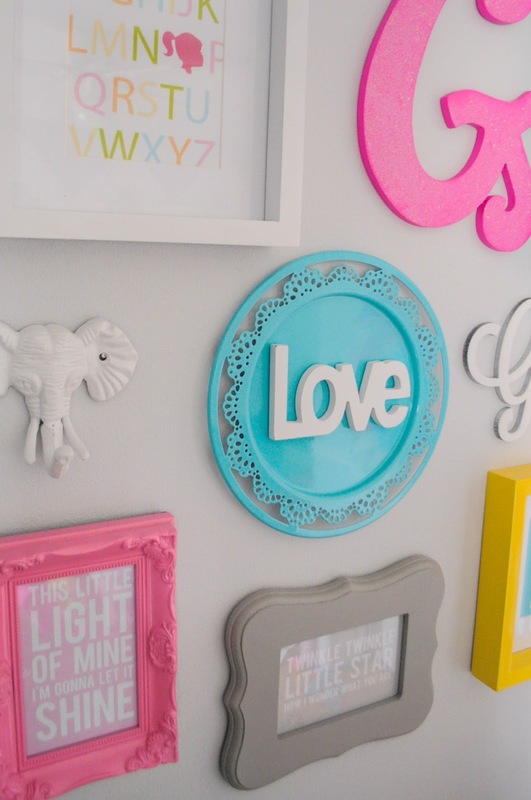 (for this DIY make sure to prime well...and flat or satin paint would have worked better...just an FYI). White Elephant: Same as above. Blue plate: $3.50 (at 50% off). I added the "love" with hot glue. The love word was from AC Moore and was $1 but I owned it already. 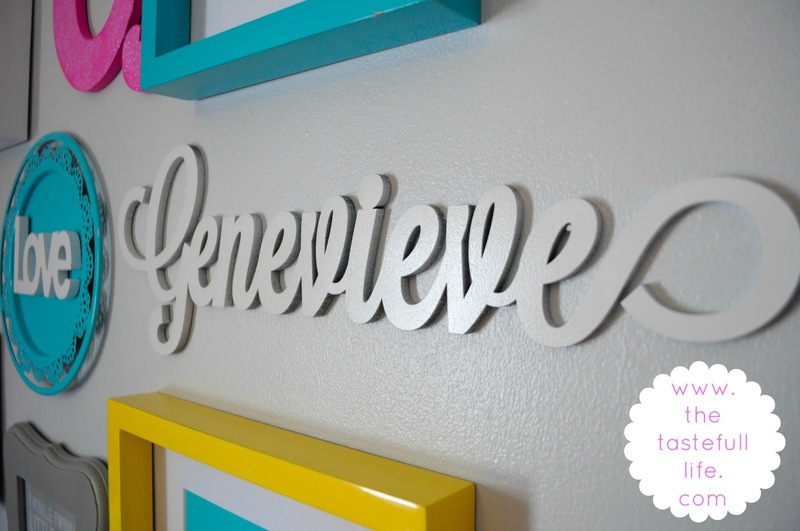 Custom wood cut out of Genevieve's name: Alexis Mattox Design. (I got it via Very Jane for $15). 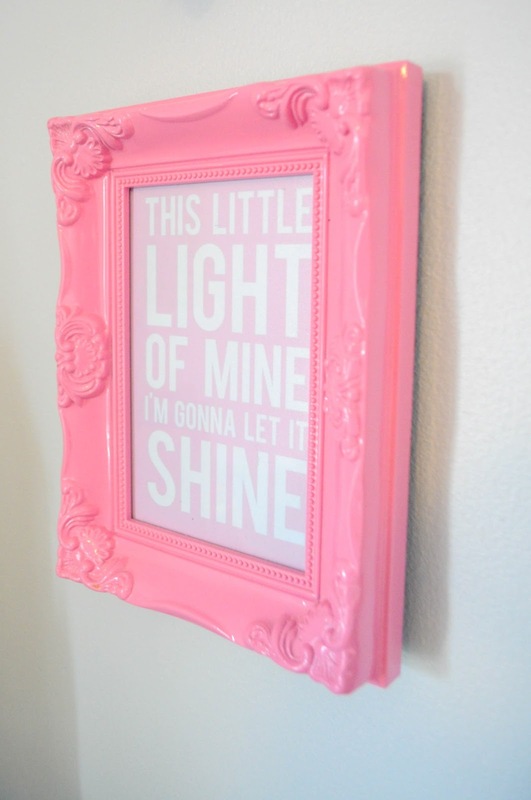 Dark Pink frame: Hobby Lobby. $7.50 (at 50% off). 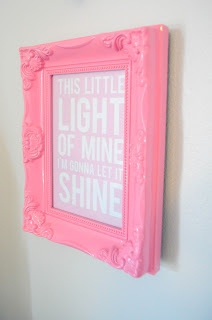 Light pink ornate frame- Already owned (also from TJs or HG). Gray Frame: Christmas Tree Shops. $2.99. 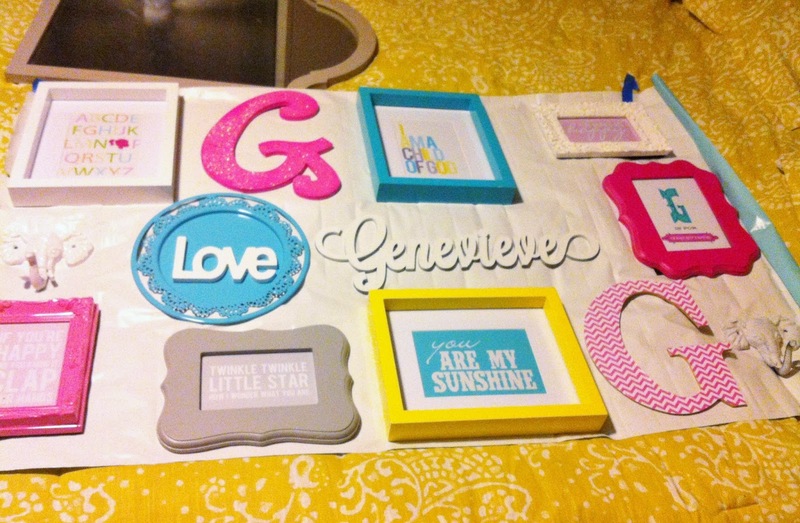 Pink Chevron G: Hobby Lobby. $2.49. I decoupaged it with chevron scrapbook paper I already had (and it only took three tries). 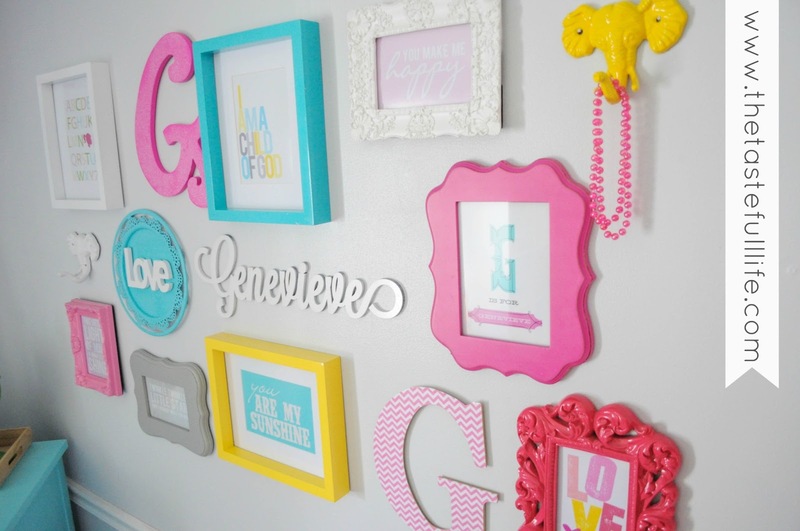 Pink Ornate Frame: Already had (TJs or HG). Total: $53 + command strips. Pastel Nursery Rhyme Series: Sprik Space. 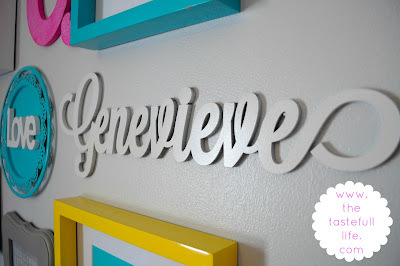 Monogram Printable: On to Baby. (Found via this post over on Chic & Cheap Nursery (Thanks Jessica!). I am a Child of God: I can't find this anywhere. :( I saved it to my hard drive a looong time ago. I think it might have been from Mormon Mommy Blogs but I can't find it when I search. 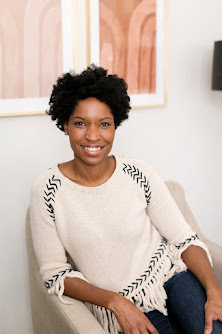 Pink and Yellow LOVE: Laura Winslow Photography. 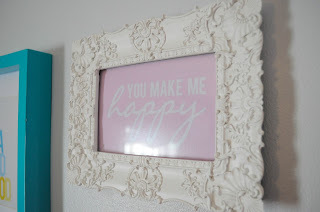 You make me Happy: Sprik Space. 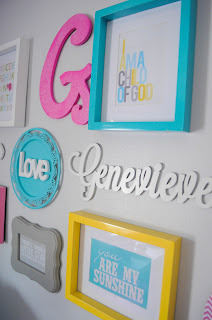 ABC print: I share Printables. (Also available in "boy" colors). You are my Sunshine: J&A Co. 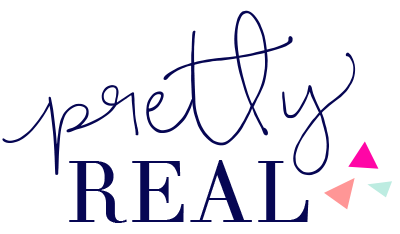 Check out my "Printables" Pinterest board for more freebies. So that's the latest. You probably don't believe me, but I'm almost finished this room! 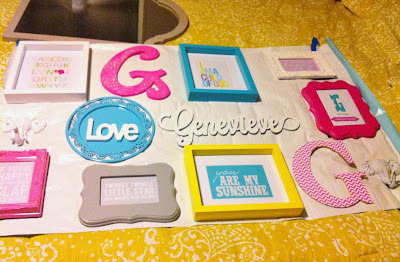 Recently, I purchased material for curtains, made her bed skirt, and found some more 3D art for above her dresser. I'm so excited to mark this room off the list! 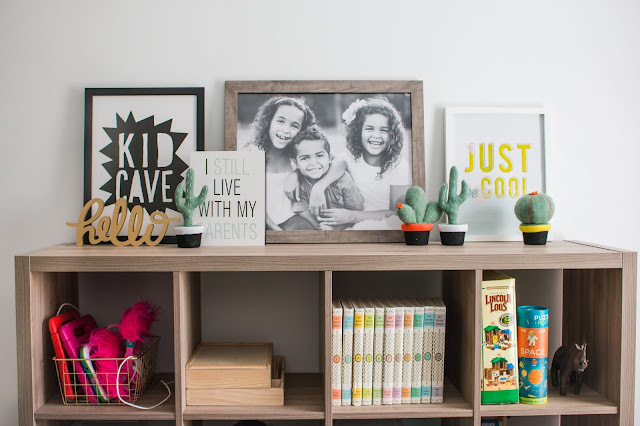 Your turn--what room re-do are you working on? 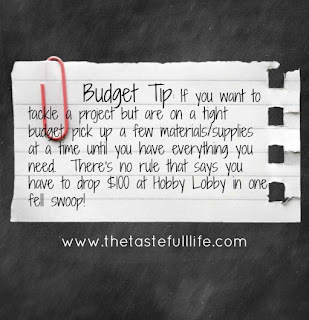 Do you get it done quickly and spend all of your budget at once or does it take you a while to collect items and/or save up? Amazing job Tiffany! I love it! LOVE this! Now I want to have a baby girl! ha! my thoughts every time I see anything cool and boyish! Thanks Jaymi!